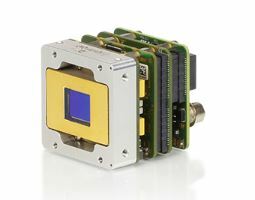 The XSW-320 SWIR module is a shortwave infrared OEM module with a resolution of 320 x 256 pixels and a pixel pitch of 20 µm. It is equipped with a single-stage thermoelectric cooler which guarantees low noise and dark current characteristics. The XSW-320 is available with a variety of interfaces and has a small form factor, low weight and low power consumption (SWaP). That makes this SWIR OEM module easy to integrate into your industrial or security system.